In recent years, the horror genre has taken a bit of a downswing. First brought to us by games such as Alone in the Dark, then popularized by Resident Evil on the PlayStation 1, the horror genre became known for producing games that relied on “jump” scares, limited amounts of ammunition and a fear of what is in the dark. However, Resident Evil 4 flipped the genre on its head and concentrated more on action than on true horror, with many other “survival horror” games following suit: Dead Space 3 and 2008's Alone in the Dark, just to name a few. Survival horror has become action horror, where ammunition is copious and monstrosities aren't frightening, but Outlast is looking to bring the genre back to basics and remind us what survival horror really means. Outlast puts you in the shoes of Miles Upshur, a journalist armed with only a video camera, who is brought to the Mount Massive asylum following a hot tip. What Miles finds inside is unlike anything he, or you, has ever seen before. The story is told from the notes that Miles jots down, and we'll keep all story details to a minimum in this review – half the fun of horror games is figuring out what is going on all on your own. To be fair, you're not playing this game for the story anyways: you're playing to be scared, and Outlast is one of the scariest games to be released in years. Outlast's scares don't come from the deranged patients that Miles comes across (though they are scary in their own right), but the environment itself. Frequently, you will find yourself in pitch black environments, where the only light comes from your camera's night vision mode. If this wasn't scary enough, your camera runs on batteries that deplete quicker than the DualShock 4's battery; when this happens, you'll find yourself at the mercy of the inmates. Outlast is all about the hunt for batteries just to be able to see – a far cry from other horror games where the hunt is on for bullets. There is just something inherently scary about losing your vision that it's surprising more games, except possibly Amnesia for the PC, have touched on. The horrors of the asylum are a lot more frightening when you can't see them, even more so when you can't fight back. That's right: Miles will never brandish a weapon during the entire campaign. Miles isn't a battle hardened soldier, so you'll never see him brandish a rocket launcher or flamethrower throughout the game's campaign. When confronted with a fight, Miles will need to hide in closets or under beds and wait for the inmates to pass, similar to games like Clock Tower on the PlayStation 1. Hiding in a closet, praying an inmate won't find you is an intense experience that few games have tried and even fewer have gotten right. Outlast succeeds on this front because of it's amazing attention to sound, such as Miles' rapid breathing or hearing an inmate scour a room in search of you. It's a given that you'll want to play Outlast in the dark, but you'll definitely want a nice pair of headphones to totally immerse yourself in the experience. It's not just the sound that Outlast uses to its full advantage, as the game takes advantage of all the little details as well. One of the more popular examples is Miles leaving footprints behind when stepping in a pile of blood, or the fact that Miles fumbles around much like a regular person would when barging through a door. The attention to detail helps sell the illusion that you're trapped in the asylum, and developer Red Barrels is to be commended for paying such close attention to each facet of the game. The game is a labor of love with production values far beyond your typical AAA game. 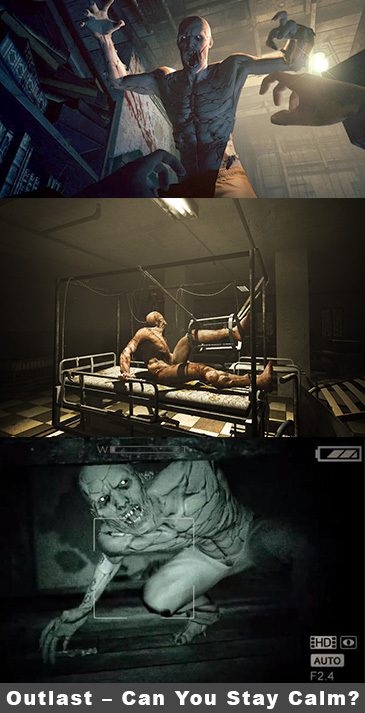 Outlast is roughly a four to seven hour long game, depending on how thorough you are in exploring the environments. Some gamers will prefer to rush through the game, while some will prefer to seek out every clue they can, immersing themselves in the game's story and atmosphere. 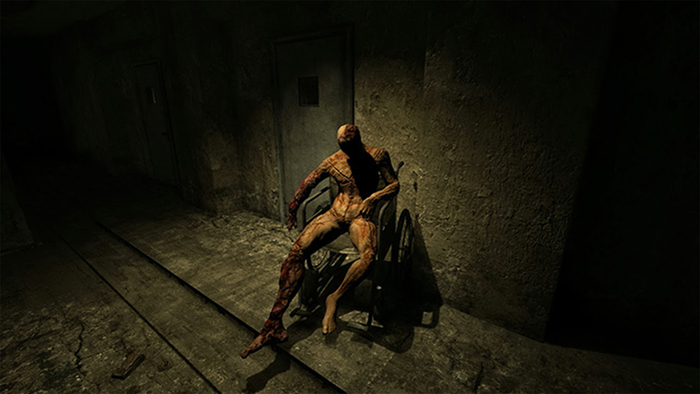 The game's length isn't necessarily a bad thing, however; even at a five hour length, the game starts to get repetitive near the end, as all survival horror games do. You get used to the game's enemies and its concepts, and what was once scary starts to become normal. Death will always cause a jump or two, but eventually death becomes nothing more than an annoyance as it means playing through the same section of the game again. Outlast starts strong but near the end, it starts to lose its scare factor. This is a symptom that plagues all survival horror games, so it's a shame to see that Outlast didn't figure out a new twist in the formula. What Outlast does offer in terms of replayability is the Insane difficulty mode, which gives you one life to play through the entire game. If you die, that's it – game over. Insane mode will force you to play the game in a whole new light, as death has meaning. It's recommended that you play through this mode only after completing the main game. In Insane mode, the scares are constant because one wrong move is going to be your last. Outlast is not just a simple port from the PC, where it originally released, to the PlayStation 4; the developers have integrated the DualShock 4 into the gameplay in intelligent ways. The touch pad can be used to control the zoom of your camera and works fairly well, though for gamers who want to use a more traditional means of control they can use the directional pad instead. Outlast also uses the light bar in a few different ways: it shows whether your camera is in regular or night vision mode and also shows when your camera's batteries are starting to deplete by changing color. When you're in a dark room, the light bar really adds to the game's immersion. Where Outlast doesn't take advantage of the PlayStation 4 is in the graphics. While the graphics of the game are fairly decent, they are a step down from the PC version of the game, noticeably in terms of textures. From far away, enemies look detailed but at close range, not so much. As an indie game, Outlast is definitely a step above the rest by not resorting to pixelized graphics, and the fact that an independent developer can make a PS4 game on par to the big publishers is commendable. If you've never played the PC version of the game, you likely wouldn't even realize the graphics on the PS4 version aren't as good. It's still a good looking game in its own right. Outlast also adds trophies to the game, however the trophy list is uninspiring. Outlast features eight trophies (and no platinum trophy), awarded for completing segments of the game, finding the collectibles and completing Insane mode. Yawn. The trophies feel like an afterthought, especially since there are only eight of them and they are incredibly boring. For PlayStation Plus members, Outlast is free for the month of February and is absolutely worth the free download. The game is rich with immersion and its repetition near the end is easily overlooked due to its short length – it may be one of the few games where a shorter length is actually beneficial. Is the game worth buying? If you're longing for true survival horror or looking for an incredibly detail rich game, then absolutely. If you're the type of gamer who gets scared easily, or you're looking for something a bit combat heavy, then give Outlast a pass. You'll regret it, though. Overall, Outlast continues the trend of amazing independent PlayStation 4 games and is a great addition to the PlayStation Plus Instant Game Collection. Its few flaws are easily overlooked by its strengths. Yesssss... Looks like a must for Playstation Plus members. Will be downloading this soon.